Comedian Laurence Clark defies the usual tags of who can do what and why and takes our thinking for a swing in The Space in his first PUSH ME short. 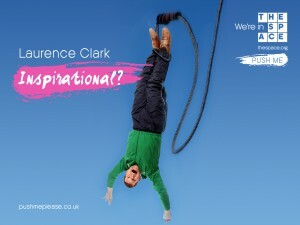 They said he was an inspiration when he started to do stand-up, when he got married and when he became father, but Laurence has never considered himself inspirational. From where’s he’s sat ‘inspirational’ is just a way of saying he’d never amount to much, but somehow got lucky. This entry was posted in General, Laurence Clark/Inspired, The Space. Bookmark the permalink.